Kitty cats, to the left we have Stella McCartney’s stunning Maia Cork Platform Wedge – the very same ones seen gracing the fancy feet of le ever-magnificent Michelle Williams and le elegant Emily Deschanel; to the right, plant your pretty peepers upon the Crespo Wedge Sandal from BCBGeneration. While the charming Crespo sports a slightly lower platform and wedge than the 6 ½-inch McCartney’s; for a mere $89.00, as opposed to the $735.00 of the mesmerizing Maia, they are a sublime way for the frugalista to snag a smidgen of Stella’s haute couture style – at a price that allows one to scoop up all four snazzy shades (Light Peach, Gold, Panna Stone, and White Black), should she so desire! 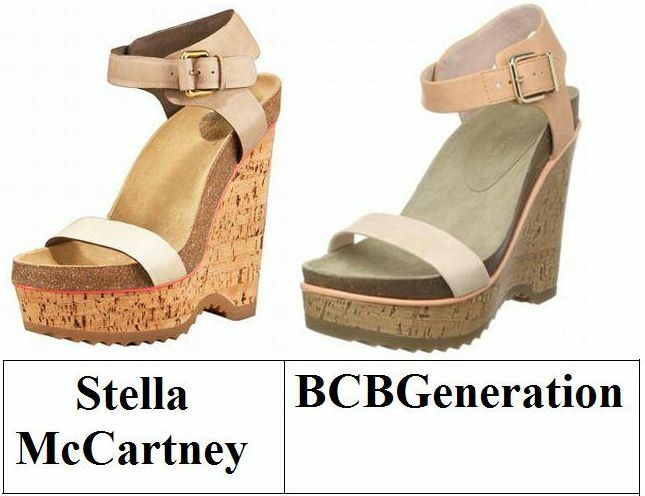 Will Stella McCartney tempt you into being a big spender, or will BCBGeneration inspire you to save? Thanks to Neiman Marcus and Endless for the pictures. Wow, that so much. I'd go for the cheaper ones. For sure. Glad their is a cheaper option. Thankfully. I wouldn't know the difference. Great more reasonable version that you found. Loveeee wedges!! Cannot wait for spring!!! Stella would definitely tempt me into being a big spendor! woah almost the same ! You always have great finds ! Honestly? this time I would save for the higher platform wedge Stella McCartney's. They are both cute but the expensive version are more stylized. Love Stella! I forgot about your love for cork wedges. Glad to see they are still in style. i'm so impressed by your finds! Save! they are IDENTICAL, great find! i have often found with cork wedges they can look cheap...so i have struggled finding a nice pair throughout the years...but both of these are super nice looking. i really like them! Such a fun look. I'm glad you found this bargain. oohhh....i like the Stellas! the inside sole is so much nicer, but the price is so high! Wow! I like the Stella pair! You notice the difference in the details, but boy is that price steep! thanks for sharing. i have a pair of cork wedges i need to get wearing this spring. if spring ever comes.. Even though the Crespos are really nice, I would have to go with the Maias. I would love to have something by Stella McCartney on my feet. I LOVE the BCB wedges! What a fantastic replica! Let's be honest, I couldn't walk in a 6.5-inch wedge anyway. I have to say, I'm pretty much in love with every piece of footwear from BCBGeneration. The extra $600 or so in savings is gravy. Sorry Stella...you know I love you too! oooh, i'd have to go for the stella mccartney ones, they're stunning!! I really like the minimalist look of these pieces. I wish it would warm up, and stop snowing so I could a great pair of cork wedges like the BCBG ones. In this case, I think the expensive Stella McCartney ones are much cuter, so today I vote to splurge!!! I'll splurge for the Stella McCartney wedges. Oh Stella never fails - those cork platforms are irresistible! And so perfect for spring! The Stella pair are tempting. I'm not a huge fan of cork plataforms, so...I'll pass this time! Such a wonderful shoe. Great you found a cheaper version. I don't like this wedge. Looks so much like a stylized Birkenstock...but anything that resembles a Birk is never good (not a Birken...Birkenstock! lol). The McCarteny ones are far more beautiful... There's something about how delicate that lovely little buckle is! I do prefer the Stella McCartney, but with such a huge price difference I'd have to go for the Crespo! Cork wedges are one of my summer must have's. I love them. THe Stella McCartney ones are so nice. Ummm... I'd save for Stella... Classier, better shade... Love it. I have some connection here in Paris with the Stella McG crew... hopefully I could be posting something someday. In the meantime I dream through your lovely words, dear. I'm torn! I prefer the Stella McCartney pair but there's no way I'm dropping more than $700 for those. The BCBG though looks pretty darn good too! Yep, I want summer again so I can wear wedge sandals again! Love the Stella McCartney ones! Oh gosh they are both so beautiful! I'd be happy with either pair.